Don't know the difference between a Venn and a Carroll Diagram? Don't know how to use one? Find that using Spreadsheet programs to be a lesson in everything but Graphs and interpretation? Spreadsheet Programs can be complex and distracting with too many features.... Teaching graphs is a simple introduction to basic graphs and interpretation of data. 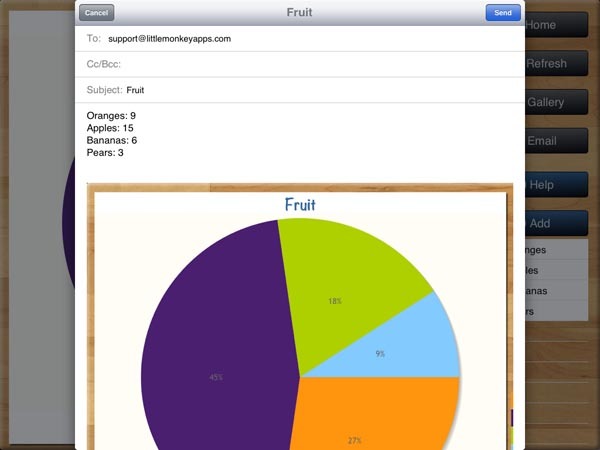 Teaching graphs includes two types of activities, 'Read' and 'Make' including picture graphs, Venn & Carroll diagrams, bar, pie and line charts. Students are asked to read and interpret data from four types of graphs, coming to recognise the features and purposes of each graph type. 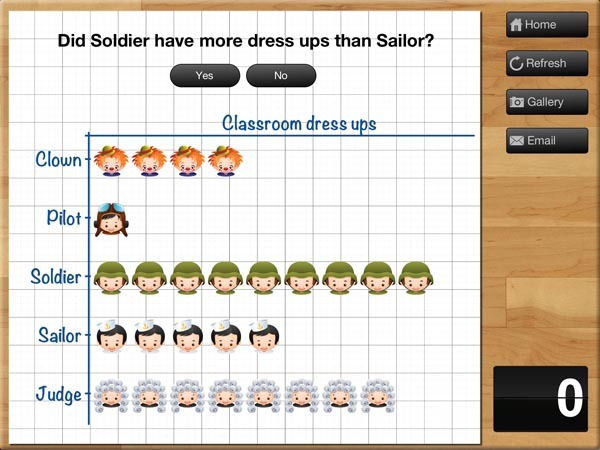 Students are also able to collect their own data and create their own graphs (4 different types of graphs) They can set labels, colours and adding values. 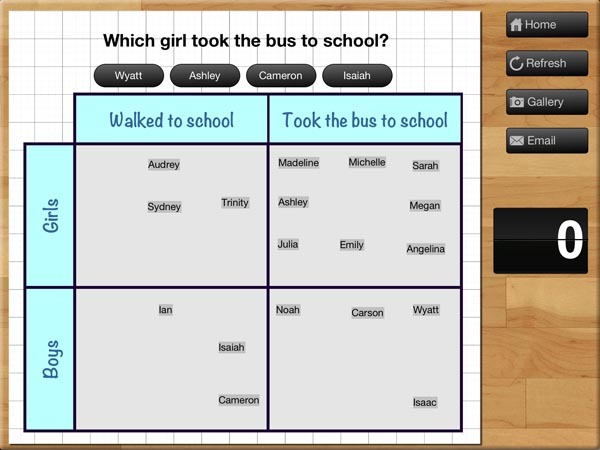 Students can email a graph or save the graph to photo gallery. There are four types of graphs that have various questions asked. The most overused type of diagram in early years education! Little Johnny likes apples and pears, but Sara likes apples and bananas! Although we have included that type of question in the App, this is just the beginning of what a Venn diagram is REALLY used for. 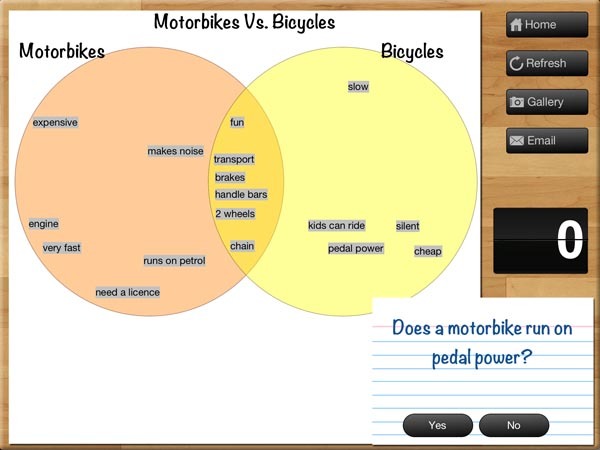 Once students have the basics, a Venn diagram can also be used to show more complex ideas in a visual and logical manner, helping children to make links between the similarities and differences of a particular set one example is comparing sets (or traits) such as motorbikes vs bicycles. A Carroll diagram is used to sort information in a 'Yes / No' manner . This type of diagram aids students to organise information in a systematic manner. 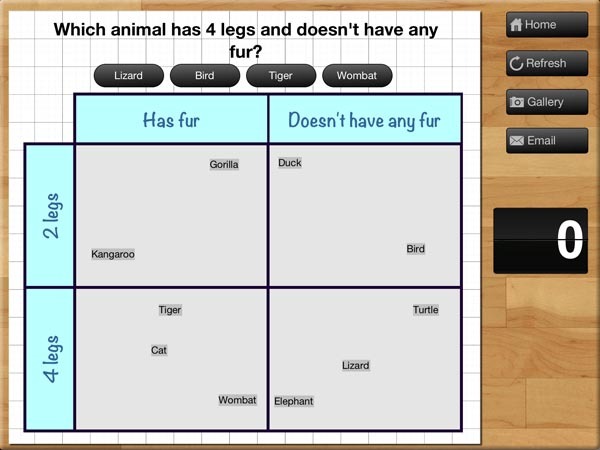 In the App, we have used two attributes (a 2 x 2 grid). Picture graphs are often the first introduction to graphing. It is important to note that the pictures are the SAME size and spaced evenly. Instead of traditional bar shapes each value is incremented using pictures. We've included marbles, sports balls, musical instruments and student dress-ups. Create a Venn diagram with 2 or 3 intersecting circles. Students can label each circle and set the colour. Items can be added and dragged in to place. 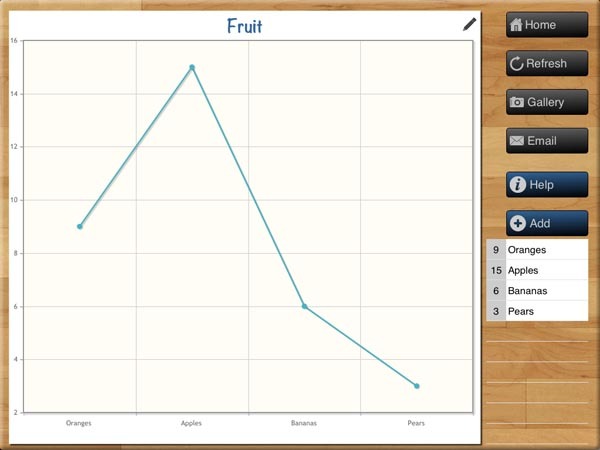 Create a single series bar or line graph. Switch between the two types of graph depending on the type of data. 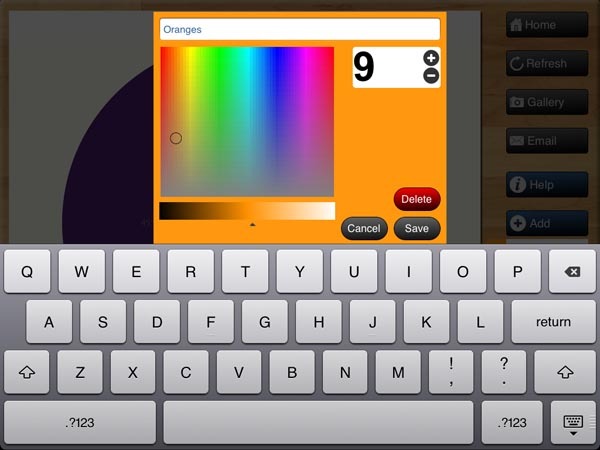 The line colour and bar colour can be set and items can be labelled. Line graphs are more appropriate for accumulative data sets such as temperature over one day whereas bar graphs can be used for temperature across a week. A 2 row by 2 column Carroll diagram can be created. Labels and items can be customised. Pie chart creation can be difficult without the assistance of IT devices as young children aren't able to understand the mathematics behind its creation (angles, using a protractor,) Students are able to create their pie chart by inputting data sets, change the colour and value for each slice. Great introduction to percentages for more advanced students..work backwards and complete the task on the App and (oh my goodness, yes, I'll say it...) by HAND! Don't know the difference between a Venn and a Carroll Diagram? Don't know how to use one? Find that using Spreadsheet programs to be a lesson in everything but Graphs and interpretation? Spreadsheet Programs can be complex and distracting with too many features.. and you want your students to ONLY work on Graphs, not font selection or Cell References. Teaching graphs is a simple introduction to basic graphs and interpretation of data. Students are asked to read and interpret data from four types of graphs, coming to recognise the features and purposes of each graph type. 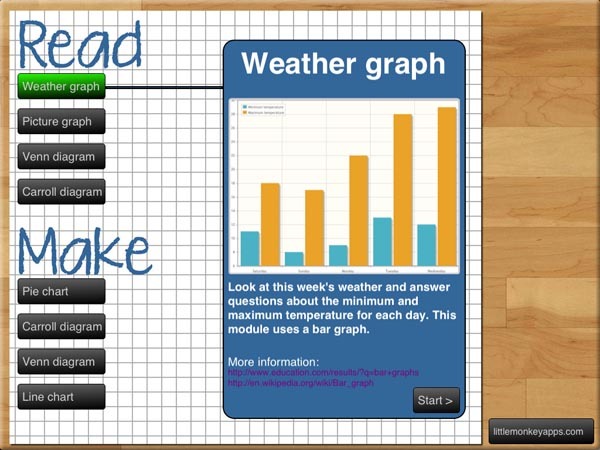 Students are also able to collect their own data and create their own graphs (4 different types of graphs) They can set labels, colours and adding values... email and save the graph to the photo gallery, the basics, that's it... if it isn't fancy enough, then this App is probably NOT fr you. The most overused type of diagram in early years education! Do the basics, go on... but it drives me personally insane that this is as far as most Venn diagram experiences go... Little Johnny likes apples and pears, but Sara likes apples and bananas! Although we have included that type of question in the App, this is just the beginning of what a Venn diagram is REALLY used for! Before you use the App, pull out Two hula hoops (but have a few extra nearby), have them separate on the floor. I like to do data sets like "Has brothers" "Has sisters" (surely someone has both and someone will be an only child!) See what conclusions they reach themselves when Kate has to been in two hoops at once! This is much more valuable than putting the idea in their heads! Then use the App to follow up with the mechanics of reading and interpreting a Venn diagram. If you are doing this with pre-readers or early readers, then this task is better suited to one on one or small group situation. Once students have the basics, a Venn diagram can also be used to show more complex ideas in a visual and logical manner, helping children to make links between the similarities and differences of a particular set one example is comparing sets (or traits) such as motorbikes vs bicycles or animals e.g. eats meat, eats leaves. 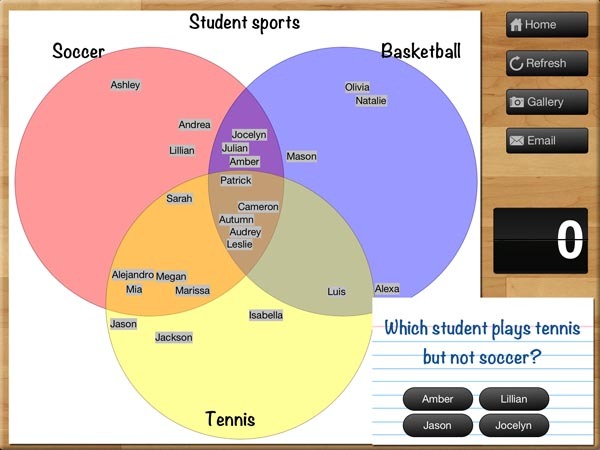 Students can then use the App to 'Make' Venn diagrams with 2 or 3 intersecting circles. Students can label each circle and set the colour. Items can be added and dragged in to place. If you aren't working with these students directly, have them email you their diagram or save to photogallery for assessment. 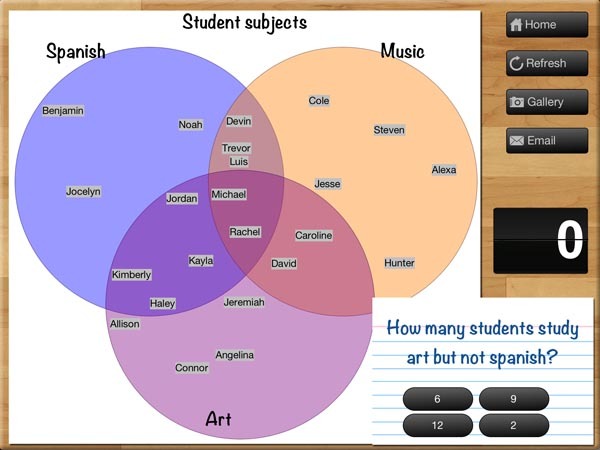 The benefit of this 'make' section is that you are not asking students to worry about layout or making sure they present the data well (although there is a time and place for pushing presentation) you can focus on the data and creation of a correct Venn Diagram. To introduce this type of diagram I like to play the game, "Sit down if...." So when you ask a question, the people who say YES, have to sit down.... Sit down if you have siblings, this quickly divides the class into two groups, Yes and No. You have just made a 1x2 carroll diagram. (Some might call this a T-Chart) Then you can move onto handing out cards with animals all over them to extend the game... Sit down if you have four legs, sit down if you eat meat. There are now four groups... You can perhaps use corners of the room. Students will either answer YES or NO to the questions, placing themselves in the correct quadrant...Then and ONLY then, you can tabulate the results and show how a Carroll diagram is set out. (They don't even need to know it is called a Carroll diagram, but it doesn't hurt to throw the name out there. 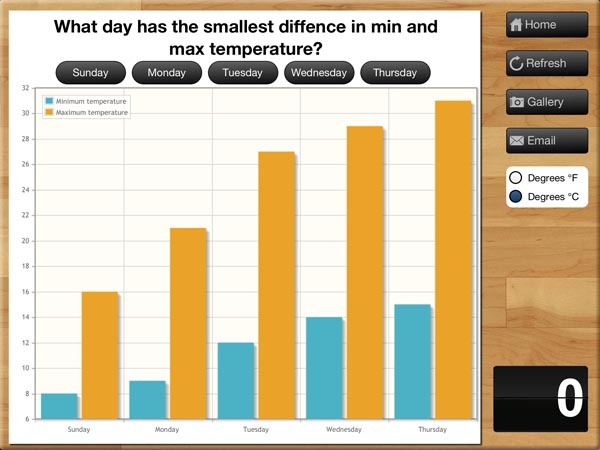 This module creates a minimum and maximum bar chart for the next five days of weather in your location. Yes! Your location! (unless you don't have internet and it changes to a default value) You might like to collect the local newspaper to see how accurate we are! Or even compare the TV broadcast with a newspaper. For those students who already know EVERYTHING about reading and interpreting graphs these types of discussions allow for extension whilst remaining centred on the same topic as the rest of the class. You can switch between Fahrenheit and Celsius. (again think about the bright sparks in your classroom) The module asks recall questions about the weather, I.e. 'What is the hottest day?' A simple introduction to reading and interpreting data presented as a bar graph. Following on from this, students can create a single series bar or line graph...perhaps on the weather, precipitation amounts, wind speed, favourite footy team. Switch between the two types of graph depending on the type of data. What another great discussion point as to why you've chosen a particular graph for a particular purpose. The line colour and bar colour can be set and items can be labelled...Nothing too fancy to detract from the task itself. Don't get me started on Word Art, Shadows and Rainbow Fill! It is important to note that the pictures are the SAME size and spaced evenly. Instead of traditional bar shapes each value is incremented using pictures. We've included marbles, sports balls, musical instruments and student dress-ups. We have not included scaled picture graphs at this stage, but it is certainly something we are looking into. If you are doing this by hand, my personal favourite way of introducing percentages is to have students collect 100 hama beads or other small beads onto floristry wire, put all of the same colours together, tie off to make a loop, then bend into a circle. Use a white kinder circle (or cut one out the same size as the wire circle) Then mark the mid point of the circle, put the wire circle of beads on the top of the paper circle and then mark where each colour starts and stops. Use a ruler to join to the centre of the circle and colour in to match. Voila! A pie chart. Then you can go on to teach that each bead is worth 1%. You might like to get fancy and only collect 50 beads and discuss how each bead is now worth 2%. You could do this with people too. Put all the students who match a criterion together, move the whole group into a circle and sit down (or stand if you want), use string or streamers, or plastic tablecloths if you want a solid colour to show the slice!